October 13, 2016 – LONDON – Neustar, Inc. (NYSE: NSR), a trusted, neutral provider of real-time information services, today announced that it is sponsoring Junior Olympic canoeing hopeful, Rachel Ellis, 13, from John Warner school in Hoddesdon, Hertfordshire. Neustar has provided a quality one-person canoe (known as a C1) and will continue to assist Rachel with her training and equipment as she progresses with her coaching at the Lee Valley White Water Centre. 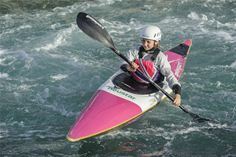 Rachel became hooked on canoeing over a year ago through the ‘Rapid Talent Identification’ (TID) programme run by the Lee Valley White Water Centre, which aims to strengthen the pool of talented athletes who have the potential to achieve future international success in Olympic Canoe Slalom. Rachel was one of a small group identified as possible champions from the students attending Lee Valley’s secondary schools. She now trains regularly and competes at canoeing events with the aim of reaching Regional Academy level. Rachel has already achieved Division 1 for kayak and canoe and is working towards the Premier division. Rachel currently practices kayaking four days every week with her main coach, Zachary Franklin, who is a men’s K1 (one-person kayak) and C2 (two-person canoe) slalom champion and part of Team GB’s Canoe Slalom squad. At the U23 World Championships he placed 11th and he has also competed at a senior level at the World Cup 2 in Krakow, placing 7th in C2. He coaches at Lee Valley, which is a world-class venue where the 2012 Olympic canoeing competition was held. The Rapid Talent Identification programme was set up in 2013 to capitalize on the success of the London 2012 Olympic Games and help create a long lasting legacy at Lee Valley for the sport of canoeing.